Simplified notions of scientific progress suggest a steady victory of empirism over superstition. Such views are today superseded by dialectical models of progress. European witch-hunts were fanned by visualizations of the invisible in mind and media. They ceased mainly due to a complex interplay of interventions mainly in the same invisible realm: psychology, philosophy and the abolition of torture. Philosophical and scientific enlightenment suffer most from separation from each other and only a combination of both was efficient in suppressing witchcraft-accusations, while secondary superstition emerged from positivism, copying scientific modes of visualization. Aware of the difficulties of synchronizing scientific with social progress, the relativist "second-spear"-paradigm of Evans-Pritchard entirely leaves the problem of enlightenment, and therefore progress: Witchcraft beliefs and empiric science do no longer compete, they coexist. Other authors like Lévy-Bruhl, Mauss, Frazer and Freud followed a different, but more convincing methodology: They worked on the microdynamics of belief, doubt, visualization which are skeptically open to intellectual progress in principle. While the current modernity of witchcraft-paradigm tends to reactivate Evans-Pritchards blotched relativism and blames witch-hunts on economic crises and harmonic conditions only disturbed by neoliberalism and individualism, it seems more rewarding to proceed with the most differentiated theory of progress so far: The dialectics of enlightenment by Adorno/Horkheimer. Critical theory offers instruments most suitable for current conditions in sub-Saharan Africa: a rapidly expanding media-industry and a complex interaction of propaganda, enlightenment, science, religion and the die-hard occult. Based on content-analysis of Ghanaian storybooks, tabloids and films, this thesis opens propaganda research for the local and specific. It focuses on the Sakawa-rumor cycle in 2009. Imagining occult rituals behind cyberfraud, the rumors were fanned by film-series and media fabrications, offering projective containers for racialized north-south-disparities and the crisis of a crumbling gerontocracy. While resentments against abstract value-generation remain universal (e.g. 'bitter money'), the specific conditions of ideology in process are of particular interest for this research. The main question was if Ghanaian films induce witch-hunts today. Visits at nine sanctuaries for witch-hunt victims and 150 interviews in Northern Ghana prove a different, but deeper connection with media. In absence of television, ordeals, dreams and confessions visualize the unseen and uncanny. Mostly elderly women are then blamed and ostracized in traditional patterns of accusations. Earth-shrines provide ambiguous shelters and exorcisms. Those institutions were often misinterpreted by superficial activism. The participant observation followed Ghanaian social workers who interact with witch-hunt victims on a daily base and organize resettlements. Their educational drama-groups visualize simple protest against maltreatment, while leaving the core of witchcraft-beliefs intact. They hope for 'education' as a more general set of mutually interacting sciences. Through this they do reflect on the difficulty to disprove witchcraft-beliefs with simple arguments that were equally absent in the European context. Often lacking literacy and education, Ghanaian enlightenment against witch-hunting relies on a simple moral philosophy and common sense – and often on ambiguous donations, as enlightenment demands for experts and workforce. Instead of exotising African witch-hunts as the incurable or sanctified other, this thesis develops a differentiated view which stays in close contact with criticism of Western phenomena. Witch-hunts pose a serious challenge to enlightenment. 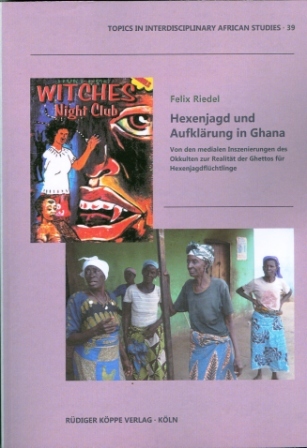 Thinking with Ghanaians but against witch-hunts then depends on utmost awareness for the dialectics of enlightenment and Adornos highlighting of secondary superstition in the west. Following the link below, you will find the full text of the review by Michael Stasik. Als Journalistin habe ich mich selber mit dem Thema der Hexenverfolgung und Zauberei in verschiedenen Ländern Afrikas befasst und sehr ähnliche Erfahrungen wie der Autor gemacht. [...] Daher stimme ich mit Riedel überein, dass die Fluchtorte wichtig sind, um den Angeklagten einen sicheren Raum zu garantieren. Ihnen müssen allerdings auch die Mittel zur Verfügung gestellt werden, sich selbst zu ernähren. Hier spielen NGOs und die Hilfe der eigenen Familien eine wichtige Rolle. Wie der Autor ganz richtig schreibt, helfen den Flüchtlingen keine „abstrakten Versprechen westlicher Sozialforschung.” Allerdings bleibt sich Riedel hier nicht ganz selbst treu, da sein Werk ob seiner theoretischen Ausrichtung eher ein begrenztes Fachpublikum anspricht. Den Opfern von Hexereianklagen ist es jedoch egal, auf Grund welcher theoretischen wissenschaftlichen Konzepte sie von ihrer eigenen Familie, ihren eigenen Leuten misshandelt und verjagt wurden. Für sie zählen nur konkrete Taten, die ihre Situation verbessern und andere davor schützen, dem Lynchmob zum Opfer zu fallen.